Numerous microbes are involved in the pathogenesis of peri-implantitis such as Streptococcus mutans, Staphylococcus aureus, Porphyromonas gingivalis, Tannerella forsythia, Actinomyces concomitant, Prevotella intermedia, and Fusobacterium species., Among the microorganisms, the prevalence of S. aureus, P. gingivalis, and A. concomitant are more at the implant site. To avoid late failure of implants due to peri-implantitis, prevention of colonization of microbes around the collars of the implant is mandatory. Thus, to improve the antimicrobial potential of the implants, titanium alloys were surface treated with mechanical blasting, acid etching, bioactive coating, anodized LASER modified surfaces which have their own merits and demerits. The biomolecules and cells involved in the early healing phase after implant placement interacted at the nanometer level. Reproducing the nano three-dimensional topography in bone may improve early and long-term interaction between host bone and osseointegrated implant. Nanotechnology is defined as “the creation of functional materials, devices, and systems through control of matter on the nanometer length scale (1–100 nm) and exploitation of novel phenomena and properties (physical, chemical, and biological) at that length scale.” In addition to antimicrobial action, nanoparticles applied to the endosseous implant surface resulted in embellishment of the surface with nanometer scale features that led to novel physicochemical behavior such as bone bonding or biochemical events such as altered protein adsorption and cell adhesion with changes in cell behavior. Hence, this study was done to evaluate the antibacterial effect of titanium, zirconium, aluminum nanoparticles coated titanium against S. aureus and P. gingivalis at 24, 72 hrs and 1 week time intervals. The null hypothesis was that titanium surface with titanium, zirconium, and aluminum nanoparticles coating would exhibit excellent antibacterial property against S. aureus and P. gingivalis. According to ISO/TR 11175:1993, the samples were prepared with the dimension of 20-mm diameter and 1-mm thickness. 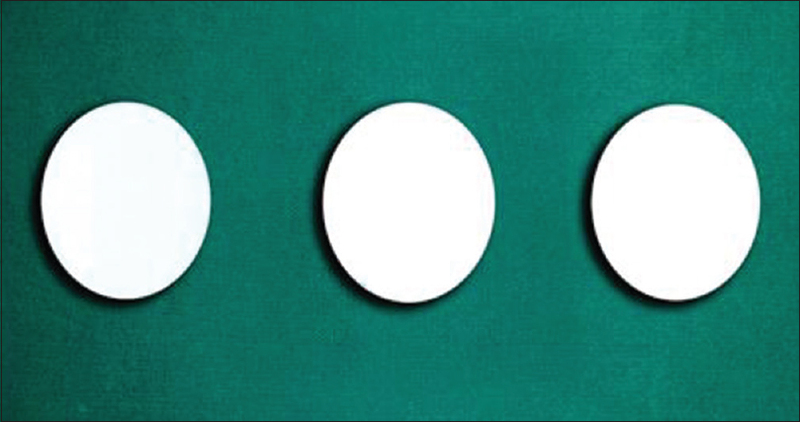 Commercially available pure Grade IV titanium (Orotig Verona-Italy) was made into sheets of 1-mm thickness. A Master's Press was used to prepare the individual discs measuring 20 mm in diameter and 1 mm in thickness. The nanoparticles were made in the form of discs pallets measuring about 16-mm diameter and 4-mm thickness by compressing the nanoparticles in a palletizer (Hirco tool, Goregaon, Mumbai, India) at 300 N for 5 min. Then, the pallets were retrieved carefully from the palletizer and sintered at a temperature of 1600°C in a furnace (VB Ceramics Pvt. Ltd., Chennai, Tamil Nadu, India) for 8 h and was allowed to cool down to room temperature. The sintered pallets were then retrieved from the furnace after 24 h [Figure 1]. The titanium discs were decontaminated by treating them in acetone (Sunil Chemicals, Kolkata, West Bengal, India) and subsequently in water. This procedure was repeated three times for 15 min and then placed in the substrate holder and titanium pallet was kept as target. The pulsed laser deposition (PLD) started with the ablation of the target material by laser irradiation. A plasma plume with high energetic ions, electrons, as well as neutrons developed parallel to the normal vector of the target surface toward the substrate due to Coulomb repulsion. The abraded particles were pushed toward the substrate along the plume resulting in a thin uniform coating over the substrate. This procedure was carried out in the presence of oxygen, and the same procedure was followed for zirconium and aluminum nanoparticles coating using zirconium and aluminum pallets as the target. 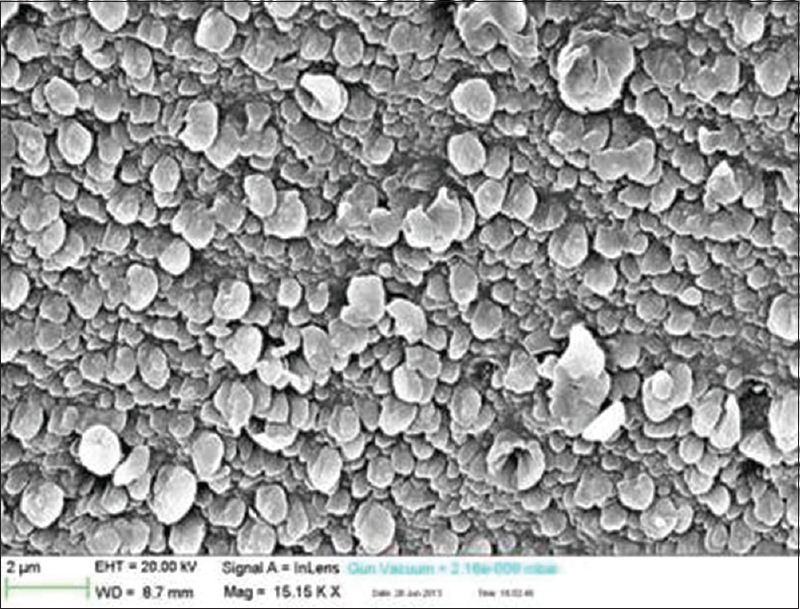 A total of eighty samples were prepared, the samples without any surface coating were considered as Group A (control), samples coated with titanium nanoparticles were Group B, samples coated with zirconium nanoparticles were Group C, and samples coated with aluminum nanoparticles were Group D.
Scanning electron microscopy using ZEISS SUPRA 55 (Carl Zeiss NTS GmbH, Oberkochen, Germany) was used to observe the surface morphology of Ti, Zi, and Al nanoparticles coating [Figure 2], [Figure 3], [Figure 4]. The antibacterial activity of titanium, zirconium, and aluminum nanoparticles coated titanium discs was evaluated by bacterial counting method. The coated specimens were sterilized by ultraviolet radiation. 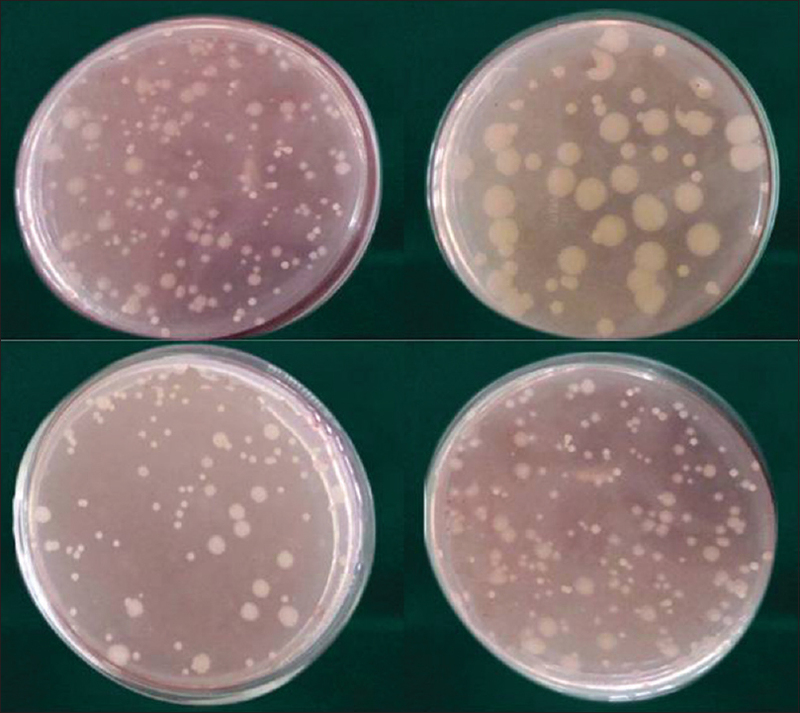 Bacterial colonies with a concentration of 106 colony forming unit (CFU)/ml were dripped onto the coated surface of the sample at a density of 0.05 ml/cm2. 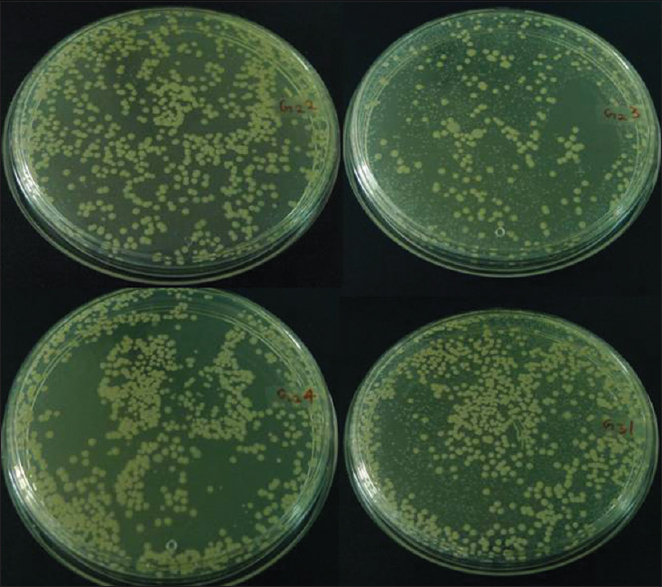 Then, it was inoculated onto a Mueller-Hinton agar medium for S. aureus and blood agar for P. gingivalis then incubated at 37°C for 24, 72 hrs and 1 week in a vacuum atmosphere [Figure 5] and [Figure 6]. The colonies were counted under a Digital Colony Count Tester (Toshiba, Tokyo, Japan). All the datas were analyzed using SPSS for Windows Version 22 (Armonk, NY: IBM Corp. Released 2013, USA). One-way ANOVA was used to compare the number of CFU of S. aureus and P. gingivalis within the groups, and multiple group comparison was done using Tukey honestly significant difference post hoc test. P < 0.001 was considered as statistically significant, and the level of significance was 95% confidence interval. The results obtained in this study were the CFUs of S. aureus and P. gingivalis. The statistical analysis showed that the CFU values were insignificant while comparing control and aluminum nanoparticles coated titanium disc against S. aureus and P. gingivalis in 24 h of incubation. However, the titanium and zirconium nanoparticles coated titanium disc showed significant effect compared to the control group at 24 h of incubation (P < 0.001) [Table 1], [Table 2], [Table 3], [Table 4]. The control and the aluminum and zirconium nanoparticle-coated titanium discs showed the same antibacterial effect on the CFU of S. aureus and P. gingivalis at 72 h and 1 week of incubation. Hence, zirconium and aluminum nanoparticles had insignificant antibacterial effect on S. aureus and P. gingivalis [Table 5], [Table 6], [Table 7], [Table 8], [Table 9], [Table 10], [Table 11], [Table 12]. Hence, this study rejected the null's hypothesis. However, the titanium nanoparticle-coated titanium discs showed statistically significant effect (P < 0.001) on CFU of S. aureus and P. gingivalis at 72 h and 1 week intervals [Graph 1] and [Graph 2]. Titanium is the most commonly used material for implants in dentistry. The clinical success rates of titanium and its alloys have proved superior than other metals because of their mechanical strength, corrosion resistance, and biocompatibility. The formation of bone directly around the implant surface was due to the formation of a thin layer of oxide on the surface of pure titanium in atmospheric conditions (passivating effect). The infection initially starts at the implant collars and then spread along the entire length of the bone implant interface resulting in failure of osseointegration. It is important to prevent the colonization of microbes around the collars of the implants to prevent implant failure. In the previous studies, vector ultrasound system and carbon fiber curettes were used to treat peri-implantitis. There were no significant differences between the two techniques, and neither proved sufficient to treat peri-implantitis. Er:YAG laser was used to treat peri-implantitis, but it could only stop bleeding on probing. Furthermore, the treatments with local antibiotics improved clinical parameters such as pocket depth and bleeding. For the success of the implants, antimicrobial property of the implant surface is mandatory so that the initial attachment and colonization of the microorganisms can be prevented. 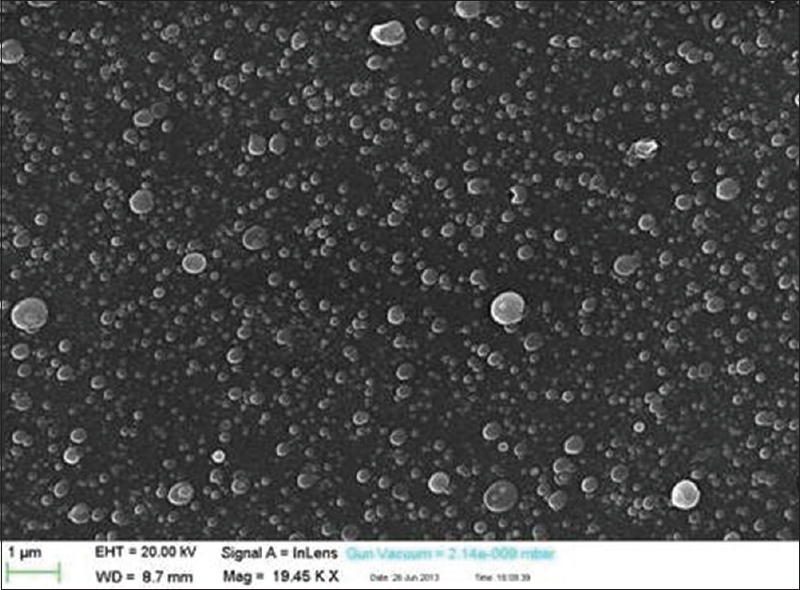 It had been shown in literature that coating of nanoparticles such as titanium and silver over titanium surfaces is likely to not only change the physical properties but also increase the osteogenic potential and antimicrobial efficacy of the titanium implants., The osteogenic potential of titanium, zirconium, and aluminum nanoparticles has been documented. TiO2, ZrO2, and Al2O3 nanoparticles have a high affinity for bone tissue, and the bone implant interface is similar to that seen around titanium implants. When inserted into subcutaneous tissue, there was development of only a small inflammatory cell infiltrate with the implant completely surrounded by a thin fibrous connective tissue. When the implants were coated with zirconium nanoparticles, significant bone implant contact percentage was found in animal studies. Hence, this study had been done to evaluate the antimicrobial effect of the titanium, zirconium, and aluminum nanoparticles coated titanium discs against the most common microbes involved in peri-implantitis such as S. aureus and P. gingivalis. In this study, the nanoparticles were coated on the samples by means of PLD. 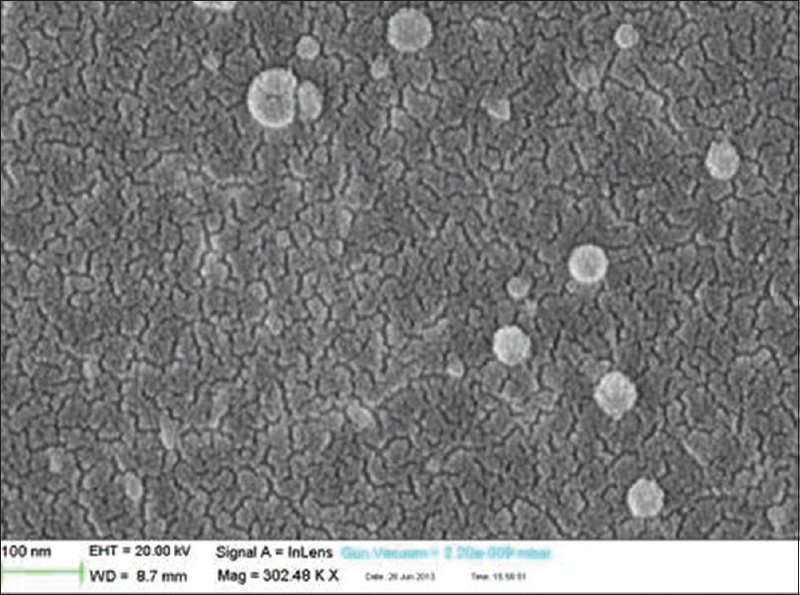 PLD is an advanced and trusted method of coating when compared to sputtering, plasma spraying, chemical vapor deposition, and powder vapor deposition., The results of this study showed the significant value P < 0.001 for titanium nanoparticle-coated titanium discs at all intervals of evaluation; hence, the antibacterial effect of titanium nanoparticles coated titanium discs was significant when compared to zirconium and aluminum nanoparticles titanium discs against S. aureus and P. gingivalis at 24, 72 hrs and 1 week time intervals. 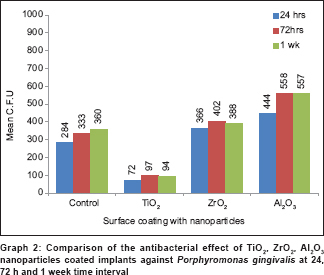 The results of this study confirmed the results of previous studies for titanium nanoparticles.,,, However, the zirconium and aluminum nanoparticles did not show significant antimicrobial effect against S. aureus and P. gingivalis 72 h and 1 week time intervals. Conventional treatment protocols such as antibiotic regimens, ultrasonic scaling, and treatment using LASERs were less effective against peri-implantitis. Coating the implant surface with titanium nanoparticles might be an efficient method to prevent the bacterial adhesion, thereby preventing peri-implantitis. Within the limitations of the present study, the antibacterial effect of titanium nanoparticles coated titanium was statistically significant against S. aureus and P. gingivalis was statistically significant at 24, 72 hrs and 1 week intervals. 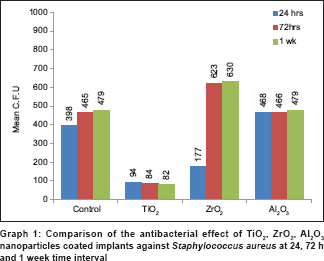 Titanium nanoparticles coated titanium showed more antibacterial effect compared to zirconium and aluminum nanoparticles coatings at 24, 72 hrs and 1 week intervals. Quirynen M, De Soete M, van Steenberghe D. Infectious risks for oral implants: A review of the literature. Clin Oral Implants Res 2002;13:1-19. Tatsuro K, Mitsuo S, Yasuo T, Moriya O, Yuichi I. Analysis of microbiota associated with peri-implantitis using 16S rRNA gene clone library. J Oral Microbiol 2010;2:5104-11. Leonhardt A, Renvert S, Dahlén G. Microbial findings at failing implants. Clin Oral Implants Res 1999;10:339-45. Novaes AB Jr., de Souza SL, de Barros RR, Pereira KK, Iezzi G, Piattelli A. Influence of implant surfaces on osseointegration. Braz Dent J 2010;21:471-81. Mendonça G, Mendonça DB, Aragão FJ, Cooper LF. Advancing dental implant surface technology – From micron-to nanotopography. Biomaterials 2008;29:3822-35. Anna VR, Ivan SC, Tetyana YN. Nanotechnology and nanoparticles in dentistry. J Pharmacol Pharm 2009;1:18-21. Muddugangadhar BC, Amarnath GS, Siddhi T, Suchismita D, Divya MS. Biomaterials for dental implants: An overview. Int J Oral Implants Clin Res 2011;2:13-24. Brånemark PI, Adell R, Breine U, Hansson BO, Lindström J, Ohlsson A. Intra-osseous anchorage of dental prostheses. I. Experimental studies. Scand J Plast Reconstr Surg 1969;3:81-100. Maurizio ST. Risk factors for osseodisintegration. Periodontology 2000;17:55-62. Karring ES, Stavropoulos A, Ellegaard B, Karring T. Treatment of peri-implantitis by the Vector system. Clin Oral Implants Res 2005;16:288-93. Schwarz F, Bieling K, Bonsmann M, Latz T, Becker J. Nonsurgical treatment of moderate and advanced periimplantitis lesions: A controlled clinical study. Clin Oral Investig 2006;10:279-88. Renvert S, Roos-Jansåker AM, Claffey N. Non-surgical treatment of peri-implant mucositis and peri-implantitis: A literature review. J Clin Periodontol 2008;35 8 Suppl: 305-15. Kong YM, Bae CJ, Lee SH, Kim HW, Kim HE. Improvement in biocompatibility of ZrO2-Al2O3 nano-composite by addition of HA. Biomaterials 2005;26:509-17. Baoe Li, Xuan Yong L, Fanhao M, Jiang C, Chuanxian D. Preparation and antibacterial properties of plasma sprayed nano-titania/silver coatings. Materials Chem Phys 2009;119:99-104. Hans-Ulrich K, et al. Pulsed laser deposition (PLD) - A versatile thin film technique. In: Kramer B, editor. Advances in Solid State Physics. Vol. 43. Berlin, Heidelberg: Springer Verlag; 2003. p. 101-7. Tachibana Y, Ohsaki H, Hayashi A, Mitsui A, Hayashi Y. High rate deposition of TiO2 by DC sputtering from TiO2-x target. J Thin Solid Films 2001;392:169-73. Borzabadi-Farahani A, Borzabadi E, Lynch E. Nanoparticles in orthodontics, a review of antimicrobial and anti-caries applications. Acta Odontol Scand 2014;72:413-7. Stoimenov PK, Klinger RL, Marchin GL, Klabundle KJ. Metal oxide nanoparticles as bactericidal agents. Langmuir 2002;18:6679-86. Martinez-Gutierrez F, Olive PL, Banuelos A, Orrantia E, Nino N, Sanchez EM, et al. Synthesis, characterization, and evaluation of antimicrobial and cytotoxic effect of silver and titanium nanoparticles. Nanomedicine 2010;6:681-8. Allaker RP. The use of nanoparticles to control oral biofilm formation. J Dent Res 2010;89:1175-86. Juan L, Zhimin Z, Anchun M, Lei L, Jingchao Z. Deposition of silver nanoparticles on titanium surface for antibacterial effect. Int J Nanomedicine 2010;5:261-7.